When Audemars Piguet announced the release of two new Royal Oak Offshore Tourbillon Chronographs to celebrate the 25th anniversary of the launch of the Royal Oak Offshore, we were not thrilled by the stock images that accompanied the press release and decided to wait until the SIHH 2018 to see the watch in person and then provide our thoughts and honest opinion about these two new references in 18K pink gold and in stainless steel. Well, we have to say that it was well worth waiting to see this new model in the metal and we are pleased to say that we were blown away by it. 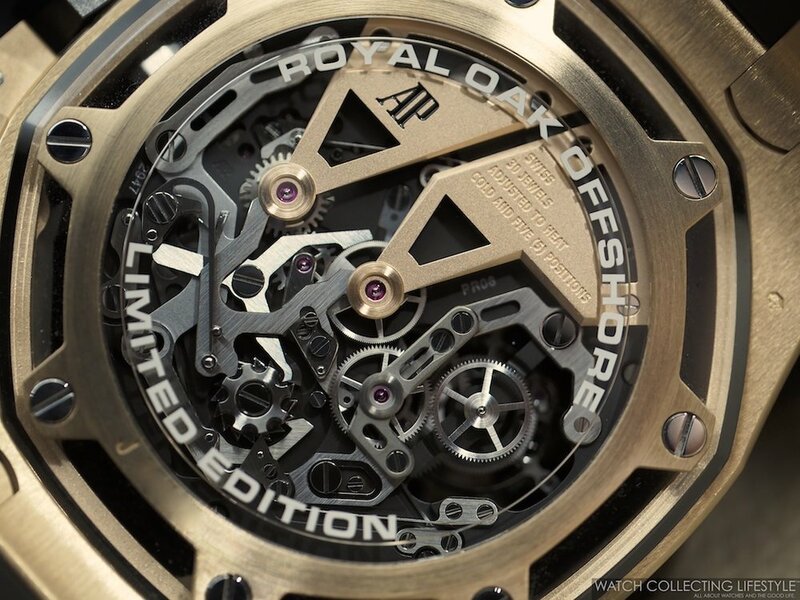 While we only perused the new Royal Oak Offshore Tourbillon Chronograph in 18K pink gold ref. 26421OR.OO.A002CA.01, we are confident that the stainless steel model ref. 26421ST.OO.A002CA.01 is as good in the metal. Fitted with 45 mm cases both watches are limited to 50 pieces only, are water resistant to 100 meters and feature a 30-minute chronograph and tourbillon. The case design this time without the usual octagonal bezel on top is massive looking and exquisitely finished. For this particular new watch, Audemars Piguet decided to add more transparency and greater visibility to this Tourbillon Chronograph. As the sapphire crystal sits on the cut out bezel with the hex screws positioned underneath and the case back has been cut our as well, one can see fully through the back. By cutting out the bezel and the case back, AP was able to fit these octagonal shaped sapphire crystals on top of the bezel and on top of the surround of the case back in order to allow for the greatest visibility possible in an incredible looking way. Once again, AP breaks the rules that has mastered over the last 140 years. The dial which in reality is the baseplate of the movement, features a new architectural construction featuring sandblasted titanium bridges and satin-brushed chamfered edges. Additionally, the movement is set up in a way as if were to be suspended from the bezel. 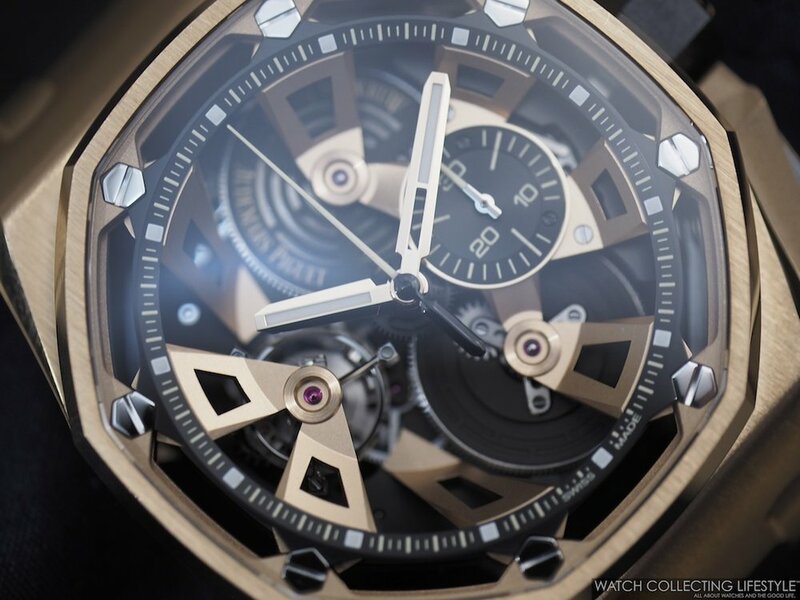 The dial features a 30-minute chrono register at 3 o'clock, an Audemars Piguet signed barrel with partial skeletonization and a tourbillon at 9 o'clock. One thing we do not understand is why the minute hand was partially skeletonized but not the hour hand. This level of skeletonization makes the watch relatively light despite its massive size in 18K rose gold. 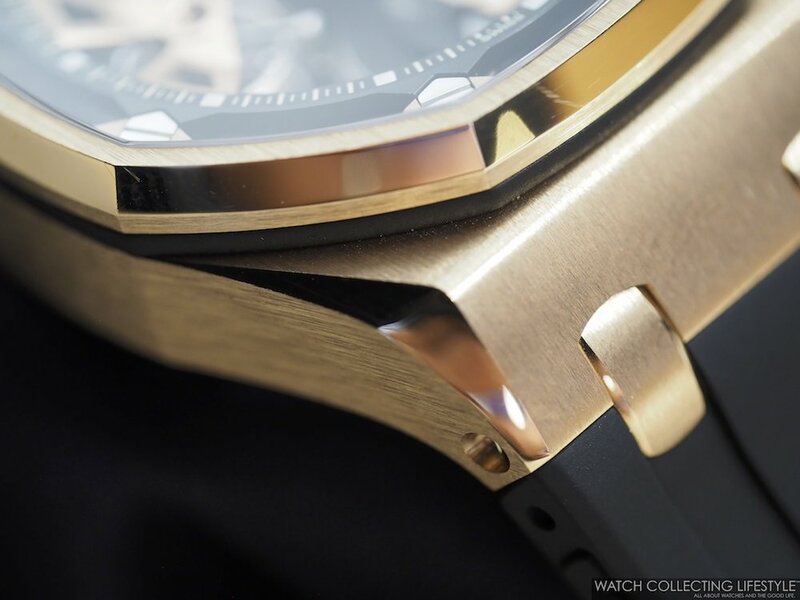 The total weight of the watch is 238.3 grams —as a reference a Royal Oak Offshore Rubber Clad in 18K rose gold has a total weight of 225 grams. The case is exquisitely finished with the immaculate satin brushed finish that Audemars Piguet is very well know for and with prominent highly polished chamfers. As far as the pushers and pusher guards, these have a new construction never seen before on any other Royal Oak Offshore. The black polished ceramic pushers feature an 18K rose gold insert and the pusher guards are sandblasted finished and cut in a very interesting shape. One remarkable thing worth talking about is the soft and buttery resistance of the pushers when pressed to activate the chronograph. Used previously in other Royal Oak Offshore Tourbillon Chronographs, the AP Calibre 2912 has been entirely reimagined to power this special 25th anniversary new watch. The new movement inside the new Audemars Piguet Royal Oak Offshore Tourbillon Chronograph ref. 26421 is the manual wound movement AP calibre 2947 composed of 353 parts and 30 jewels, which provides a power reserve of seven full days —173 hours. On the wrist, the new 25th anniversary Audemars Piguet Royal Oak Offshore Tourbillon Chronograph ref. 26421OR wears more like a 47 mm piece if you have a 7.25" wrist. The watch is delivered on a black rubber strap with 18K rose gold pin buckle. Once again, this new Royal Oak Offshore breaks all the rules and is one of the most incredible looking Tourbillon Chronographs in the market. Its looks and craftsmanship totally in line with its price tag. If you didn't like this watch in the stock images we first published last year, we are confident that these live pictures will convince you otherwise. Sticker Price CHF310,000 Swiss Francs —approximately $331,000 USD. For more info on Audemars Piguet click here. Posted on February 8, 2018 by Editor & Publisher and filed under Audemars Piguet and tagged Audemars Piguet Royal Oak Offshore Tourbillon Chronograph Audemars Piguet Audemars Piguet2018 Tourbillons Tourbillon Chronographs Mainstream Brands Most Popular 2018.